Many of us are diligent about keeping our walkways and driveways free from snow and ice, but we often overlook the hazards of snow and ice build-up on our roofs. If you live an area plagued with heavy snowfall, the accumulation of snow and ice on your roof can cause major structural damage, especially if you own an older home; not to mention the increased risk of serious injury resulting from falling ice. Finding an inexpensive long term solution, such as a radiant heating roof deicing system, is essential to the structural integrity of your home as well as the safety of you and your guests. According to the Institute for Business and Home Safety, most roofs are able to withstand around 20-pounds per square foot. This means your roof should not exceed 4 feet of new snow, 2 feet of old snow, or one inch of ice. To find out exactly how much weight your roof was designed to withstand, refer to your building design plan. An even bigger danger is the formation of ice dams on roofs, usually caused by a warm attic melting snow, causing water to run down and refreeze near the roof gutter. Ice builds up and blocks regular drainage, allowing water to seep down and damage the attic and walls. The heavy ice formations on the eaves caused by ice dams are the most significant safety risks for businesses and home owners. Manual roof snow and ice removal is dangerous business and can increase the chances of damage to the roof. Most safety and disaster prevention organizations recommend hiring a professional contractor to do the removal, but this only provides a one time, short term solution to the problem. A roof deicing system, such as Warmzone’s low-voltage roof heating systems, mount discreetly under the shingles (or metal) of the eaves and/or valleys of your roof, preventing the formation of ice dams. The option to heat the entire roof is also available. Warmzone also offers self-regulating radiant heat cable installed in channels of aluminum panels for maximum heat transfer to heat roof edges. The system eliminates dangerous ice forming and greatly reduces the risk of damage to your roof. You will be able to skip the cost of hiring a professional contractor to remove snow after each heavy storm. Self-regulating heat cable systems are surprisingly simple to install, offer maintenance free snow and ice removal, and best of all, they are efficient and have low operating costs. Investing in a roof deicing system also raises the value of your home and extend the life of your roof. Other preventive measures should be taken before snow begins to fall, such as clearing debris from all drainage systems. During winter months, it is important to keep your window wells and walls free of snow. Simple maintenance and the installation of a roof deicing system will go a long way towards protecting your home or business from natural disasters, and eliminate the possibility of injury caused by falling ice. As the housing market crash continues, it seems that even the falling prices, incentives and rebates still aren’t enough to entice new buyers. A year ago a finished home would sell in 4.3 months, it now takes an average of 6.3 months. If you are already a home owner, switching your home from fossil fuel heating to electric radiant heat will not only help protect your investment, but provide an earth friendly efficient alternative that will make your home more attractive to potential buyers. 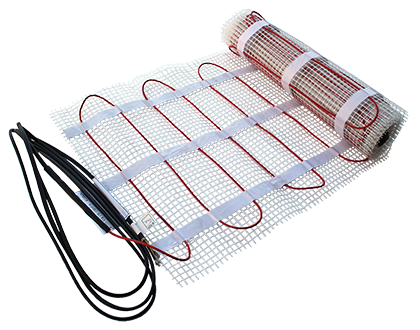 The best choice for radiant heating is the ComfortTile cable and mats. The CT systems continue to be Warmzone’s best selling electric heat product, and it’s no wonder considering Warmzone attaches a 10-year warranty to every system sold. This system is the most robust radiant heating product on the market and is manufactured by an industry leader that has been providing quality products for decades. ComfortTile radiant floor heating cable pre-spaced in mat. The most popular spaces for radiant heat in the home are the kitchen and bathroom areas. These areas tend to be the largest area of tile in the home, which also makes it the most difficult to heat. Forced air heating systems only warm the air, which leaves the floors cold and drafty during cold weather months. Radiant heat provides a uniform temperature from ceiling to the floor and warms all the objects and furniture it contacts. The ComfortTile radiant heating mats are the easiest systems to install. They arrive with the CT cable already woven into it, and comes with a convenient, easy-to-use adhesive backing. Warmzone’s website is filled with information about how to best install the product beneath tile, stone, and concrete applications. We also have a full staff of professionals available to help you through every step if you choose to install the system yourself. If installing it yourself isn’t your thing, Warmzone has a network of installation professionals in your area that are experienced installers of our systems. Warmzone has now made the ComfortTile mats more affordable than ever, making it easier for everyone to enjoy the warmth of radiant heating in their homes. Now is the best time to start remodel projects and ready your home for the upcoming winter months, especially if you are pouring new concrete. Warmzone was recently approached by the Forestry Resources Department of the University of Minnesota, Twin Cities, with a horticulture study that needed Warmzone’s help. The solution: ClearZone radiant heating cables. The University purchased 46 reels of ClearZone heat cable to measure growth variations in different temperature plots. University officials chose the ClearZone system because of the easy-to-program thermostat, versatility and high durability in outdoor conditions. The radiant heat system enabled Forestry Department students and faculty to create controlled environments in which to conduct accurate growth rate studies. The predominant outdoor use for the ClearZone system is to heat driveways, parking lots, sidewalks and bridges. It is especially useful on disability ramps, where safety and ease of use is most important. In the past, radiant heat systems have been viewed as a luxury that only a few could obtain. But that’s changing. More and more consumers living in cold regions are discovering that the benefits of radiant heating far outweigh the initial cost. The study by the University has opened up new avenues for radiant heating that have never been used before. 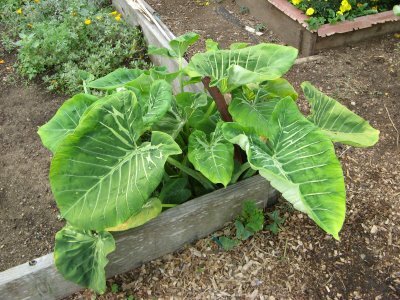 Although still a new concept, the study proves that radiant heat has the potential to be used by home and garden enthusiasts to create a tropical oasis in just about any location to maintain ideal growing conditions.